The mother of all the feed plugins is back: Better Feed version 2.0 just hit the repository and it's now even better than better. For those who don't know it, Better Feed allows you to highly customize your feed, adding basically anything you'd like below each item: a copyright notice, an "Add to delicious" link, a promotional message, tag links, incoming links in Technorati or Google, you name it. It also makes your feed comply to the "Read more" link, just like your blog posts: you'll be able to tease your readers and keep some surprise off the feed. This long due update brings a very neat interface with real time preview — no more dirty coding in the plugin file itself. It's for WordPress 2.5+ and is completely happy with 2.6 as of today. Get a Better Feed today! Is it possible to run PHP code? I always need to hand-code "related posts" functionality at the end of the feeds. Being able to include that PHP code without hacking plug-in files would really be a killer. Thanks so much Ozh…!!! I was searching a WordPress plugin for customizing my feed and I find it here!!! Maybe Im just seriously retarded but I think I broke my RSS feed on one of my sites. I cant for the life of me, get it to work. It keeps telling me theirs errors but Ive checked it and rechecked it again and AGAIN! Isint an RSS feed like THE easiest thing to set up? lol. I saw some additionnal information on the bottom of you feed and thought it came from this plugin (un cordonnier bien chaussé, dirions-nous). It announced « one comment » but they were 4. In fact, I think you have to make this dynamical information with an rendered text image, calculated by WP at display time (and not when the feed is read). Do you think of this further enhancement for your plugin ? 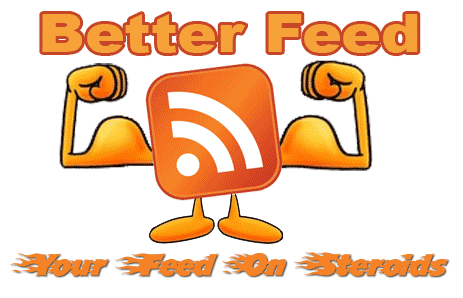 Post: Better Feed for WordPress: Now Even More Better!